When I started this teaching job in a public elementary school, I was assured that one of the duties that we 원어민 ["native speaker instructors"] had was to teach a weekly English class to the teachers at our schools - to help them maintain and/or improve their own English language skills. This had always struck me as a great idea, and it was something I'd recommend to enlightened hagwon management as well. Well, I got to teach my first conversation class for teachers today, with about 3 weeks left on my one-year contract. I guess my school just didn't get around to it, until now. I'm glad I actually got to do it, though. Last night, I had trouble sleeping. I'm clearly being troubled by things, lately. Stress around the upcoming job change, I'm sure. Maybe stress around other things, too. I don't know. I drifted in and out of waking up, this morning, for longer than usual, and kept having these mini-nightmares. I was being chased by a bear in a snowy wilderness. I was paralyzed, lying on the floor of my classroom, while my students tried to get me to respond to them. I saw a flood happening on the floor of my classroom, and I kept clicking on some "stop flood" icon on a computer, to no avail. I was late for a bus, and tripped and fell into a hole in the street. Sometimes there's a poignant moment when my students make me overly conscious of my aging. The random comments, "Teacher, white hair" - pointing at my head. Or the comment on there being wrinkles on my forehead, which is somehow a significant observation in Korean culture. The other day, I was spending a few moments at the end of my 4th grade afterschool class playing "duck, duck, goose," and Ye-won stood behind me, tapped my head, and the paused and said, with apparent alarm, loudly, "Teacher! No hair!" Yes, my hairline is receding... yes, it's thinning. Every day, here, is a continuing exercise in humility. "I bow in repentance of all the stupidity that I believe by feeling only [the sensations] of my body." This is #42 out of a series of 108 daily Buddhist affirmations that I am attempting to translate with my hands tied behind my back (well not really that, but I'm deliberately not seeking out translations on the internet, using only dictionary and grammar). 40. 내 코로 맡은 냄새만 옳다고 생각한 어리석음을 참회하며 절합니다. "I bow in repentance of all the stupidity that I believe by only following the smells my nose finds." 41. 내 입으로 맛 본 것만 옳다고 생각한 어리석음을 참회하며 절합니다. "I bow in repentance of all the stupidity that I believe by only trying tastes with my mouth." 42. 내 몸으로받은 느낌만 옳다고 생각한 어리석음을 참회하며 절합니다. I would read this forty-second affirmation as: "I bow in repentance of all the stupidity that I believe by feeling only [the sensations] of my body." Is this related to the fact that today (Wednesday) is staff volleyball day? I definitely feel stupid, through the sensations of my body, when I try to play volleyball. Yesterday, I got permission to leave work at lunch (Monday being a good day since I have no classes after lunch) and run into Gwangju to go to the immigration office and try to at least get the routine visa-extension I need to be able to stay and finish out my current contract. The situation with the visa renewal for my new job is that they've basically told us (me and my new boss) that we were trying to get the renewal too soon. Going to the Gwangju immigration office has a similar feel to a LA Westside DMV - right down to the demographics - very roughly: Koreans, some caucasians, assorted other Asians, some random Russians and eastern Europeans, a smattering of South Asians and Middle-Easterners. All that's missing is the Latin component, although the Filipinos stand in well for that. And all mired in impenetrable bureaucracy. For once, something went right. I stayed very friendly, and started out meticulously polite in my fractured Korean. And after about an hour, I got my extension, although they felt compelled to call the Uijeongbu office (which is the parent office to the Ilsan office), which helped them exactly zero. But... so now I'm good until I start my new contract, at which point I can play it again at the Ilsan immigration office, I guess. I took the bus back from Seoul, yesterday. There was an advertisement on the back of the head-rest in front of me. It said: "Happy Bus-Day." As Bus-Days go, it wasn't bad, I guess. ... I saw fields green with the young spring barley. ... I saw a man kneeling beside the tollway next to his SUV, which had a flat tire. ... I saw a banner with a Japanese flag and the words (in English): "Don't give up, Japan." ... I saw a motel designed to look like a Russian Orthodox Church. ... I saw a single broad patch of snow on a hillside of brown grass, near Gongju. ... I saw a shed on fire, in a field, with a great billowing cloud of white smoke. ... I heard "Aguas de março" sung by Elis Regina and Antonio Carlos Jobim, on my mp3 player. ... I saw a cow sleeping in some dirt. ... I saw a reproduction of a watercolor painting of Paris' St.-Germain Square on the wall over a urinal at a tollway rest area. ... I heard grumpy old people with thick Jeolla accents pronouncing Yeonggwang as Yeom-gang. ... I saw a tall young man with tight jeans and shiny purple combat boots yelling into a cellphone and dropping his iced coffee onto the pavement. ... I heard Talking Heads' "Found a Job" on my mp3 player. ... I saw brick farm houses with solar panels on their flat roofs. ... I read 50 pages of Haruki Murakami's Kafka on the Shore. ... I saw many, many pine trees dancing under the sky, their roots sunk in the red-gold earth, looking like ink-drawings. ... I heard The Cure's cover of David Bowie's "Young Americans" on my mp3 player. ... I saw tiny villages packed up into narrow valleys, limned with leafless trees, where all the houses had blue tile roofs. ... I saw an angry-looking euro-dude with Miami Vice sunglasses, spitting onto the sidewalk like a Korean. ... I saw a giant statue of a squirrel. ... I ate something vaguely resembling tater-tots, with a spicy sauce. ... I saw a bridge over the tollway that had trees planted on it. ... I saw hundreds of plastic greenhouses, filled with hothouse vegetables growing, looking like large worms swimming in formation through the still wintery fields. ... I heard Juanes' "Fijate bien" on my mp3 player. ... I saw families having picnics at the graves of their ancestors at random locations on hillsides alongside the tollway, and there were many children hopping happily, too. ... I saw a crow perched on the sign that indicated the Yeonggwang County line. I was almost home. I had a very strange dream. I was gathering lint. I was on my hands and knees, on a carpeted floor (itself rather alien, given how rare carpeted floors are, here in Korea), picking up little bits of lint. Once I'd gathered a small handful, I'd stuff it into a plastic "Family Mart" (convenience store chain, here) bag. Then I'd get down and get more lint. I wasn't the only one doing this, in the dream. I had students and friends helping me. There was a lot of lint to be gathered. That was the whole dream. It was stunningly vivid. And utterly pointless. OK. What the hell does a dream like that mean? I sometimes worry that I'm a hypochondriac. But my worries turn out to be baseless. I've been going through a difficult time. Feeling like I'm doing inadequately as a teacher. Struggling to tolerate the constant edge-of-utterly-failed-communication, at work. Stressed and on edge about what might or might not work out or fall through with respect to my upcoming job change (it always feels contingent until the visa paperwork is processed, and that's proving complicated and fraught with, yes, more miscommunication). I have to go to Seoul this weekend, again. I've been feeling burned out on any kind of travel, since my Australia/NZ trip two months ago, and so I'm not looking forward to it at all. I look forward to getting back to living in the city, but I have zero interest at this point in whirlwind weekend trips. I'm feeling unhealthy and woke up with terrible insomnia this morning after only about 5 hours of sleep. I kept running through what I'm doing wrong at work. I kept speculating on what I would do if, for whatever arbitrary and random bureaucratic reason, my visa problem prevented me from starting my new job in May. I kept thinking about the way that life in Korea is a constant almost unbearable coping with arbitrary and random bureaucratic events. The reason Korea is spelled with a K and not a C (as in the old spelling, Corea), is because of Kafka. Kafka's protagonists are generally known as "K." Imagine a whole country as a protagonist in a Kafka tale. Sigh. It was several years ago, now, that my Korean friend Curt told me: "You have no jeong." Many Koreans have an exceptionalist view of this emotion that is described by the word jeong [정 (情)] - they will explain that it is a uniquely Korean emotion, or that Koreans uniquely tend toward it in contrast to members of other cultures. The dictionary tells us that jeong means something like: love, affection, attachment, sentiment, strong feeling, concern, matter-of-the-heart. I found a fascinating academic write up on the word online, which I unfortunately cannot recommend to non-linguists because of its utterly obtuse non-standard romanization of Korean, which renders 정 as [ceng] - I believe this is called the "Yale" romanization, and while as a linguist I understand the motivations behind it, I dislike it intensely because it is very remote from being accessible to non-specialists, leading to inevitable mutilations of pronunciation. Here is a more typical exceptionalist presentation of the concept from a "study English" website (i.e. it's an essay talking about jeong as unique to Korean culture, written in English to provide a chance to study aspects of English - this kind of thing is everywhere in Korean English educaction at all levels). At the time that Curt made his assertion, I was skeptical, on two counts. I discounted the exceptionalist view that there could exist a basic "emotion" that was unique to one culture, and I also rejected the idea that I lacked it. I suppose, in part, my feelings were hurt. And when it comes to notions of language and culture, I tend toward universalism - I assume that basic human emotions, for example, are the same for all humans. So I attributed his statement regarding my lack of jeong as a simple issue of there being a language barrier - surely a truly bilingual person could identify the proper English equivalent, both in linguistic and cultural terms. But now, several years later, I have begun to genuinely harbor reservations about my prior rejection. I find the workings of Korean jeong mysterious and impenetrable. It seems to be a hybrid of irrational loyalty and intense platonic love, with a strong seasoning of smarmy sentimentality. And I've come to accept that, as a Westerner, I probably "lack" it - in that I have no reductive mental category that encompasses these sorts feelings in simple conjuct. When Mr Choi throws his arm around me at the staff volleyball game, that's jeong. And when the staff take up a collection of cash to help my fellow teacher pay his outrageous electricity bill, that's somehow also jeong. When a teacher admonishes a student to study harder, that might be jeong, too. I keep trying to figure it out. I'm hereby retracting my vote for Mr Obama. I was never what you might call an idealistic supporter - I've been pretty cynical about US politics for far too long. And actually, I was impressed, at first, by his apparent pragmatism, his calm demeanor, his capacity for compromise. But when I decided to abandon my pointless third-partyism for Mr Obama in 2008, I was motivated by certain promises more than others. Not just the promise, in general terms, of a more intellectual, even cerebral, president, but also... I fully expected and counted on seeing him work hard to reverse Bush's attacks on civil liberties and the never-ending jingoism. Obama's utter failure to even begin to reverse the civil liberties issues, his constant re-assertion of the Cheneyian imperial presidency, the continuation of Guantanamo despite explicit promises to close it even once arrived in office... these were deeply disappointing. But the interests-driven, ill-considered dive into yet another oil-state war has felt like a "last straw" - I can no longer support this man. Can I unvote? Not that McCain would have been better - god, no. He'd have been much worse, I have zero doubt. But I'm going to go back into my third-party closet, now. And remain content to be an expat. This video is very cute. I like the minimalist animation style. I've written before about what a strange place Ilsan is. I've compared it to a space-station, because of its modern artificiality. I've described it as "Sim City" because of its regular and somewhat boring urban plan. Its upper-middle-class, highly educated and "aspirational" demographics make it rather unique in my experience of Korean places, too. I went up over the weekend for a very brief visit to drop off my paperwork for my visa renewal with my new boss, for my new hagwon job that will start May 1. I was walking around this strange place that feels like "home." It's as different from Hongnong as Iowa is. It's not even like the rest of Seoul, although I know there are other enclaves around Seoul, other "new cities," that resemble Ilsan. But Ilsan seems unique because of its scale (more than half a million residents) and the vast regularity of its grid-like layout on basically flat land (in and of itself rather hard to find in Korea). Manhattan-on-the-rice-paddy. I had a new insight, on Saturday, as regards my own strange "destiny" with respect to Ilsan. When I was young (a child) I would often draw maps of imaginary places. Ilsan, in fact, has some rather striking resemblances to the kinds of "designed" or "engineered" places that I often tried to create, based on my rather utopian-yet-gritty (if that's possible), naive conception of urbanism - recall that I grew up in a small town and my relationship with cities was intense (I loved them even as a child) but limited (my parents did not love them). So my destiny, in Ilsan, lies only in that it resembles a kind of "city as I imagined it" as opposed to being a "real" city. Perhaps this is also similar to (but not causally connected to) my strange feeling that Korean is a a "langauge as I imagined it" as opposed to a "regular" language, too. Not to deny the fundamental, external reality of either the Korean language or of the city of Ilsan. Just that they have certain striking predecessors in my imagination, and hence I feel a weird connection to them. Now... if only I could "figure them out." I dreamed last night that I was starting a new job. That's really logical, given that I've traveled to Ilsan to meet with my new boss to work out some paperwork on getting my visa renewed. But in the dream, the new job was not my "real" new job. It was something like one of my old computer-related jobs: database design, business systems analysis, web-based application support. Nevertheless, the job was in Korea. In Ilsan. My new coworkers were Koreans, and they were showing me around the building where my new job was, and we were bowing to various bigwigs, per appropriate Korean custom. And then they insisted that I see the mall attached to the building. We were walking around an Ilsan-like mall (like the one here called Western Dom), but my dream coworkers were my new coworkers at Hongnong, Ms Lee and Mr Goh, along with other various Hongnong teachers. Despite that, we were talking about databases and annoying end-users of data-intensive websites, and making sure that code prevents SQL injection, and how to make stored procedures effecient when you couldn't know which search parameters you were going to get ahead of time. Yes, that kind of thing. Although it seemed like they were insisting I should know more about Korean history, too. But then, in the mall, some woman came up to us and said we should take a class about the mall. "A class? About the mall?" I asked. "Yes, there is so much to learn about this mall," she insisted, excitedly. So we went to the class, where we got pitched a neverending spiel about all the different stores and restaurants to be found in the mall. This was so boring, I woke up. What... did I fall asleep with the television on? No. Dreams are strange, and even when they appear to be meaningless, they nevertheless reek of some obscure meaning. The church next-door to my current apartment (which is just across the school-yard from the school where I work) keeps chickens and ducks. The roosters here are very vocal. There was a reliable rooster or two that I could hear in the predawn hours at my last apartment, in Yeonggwang, but they were farther away. These are quite literaly located on the other side of my east-facing wall, in a little barnyard behind the church. I've been a little bit puzzled by the idea of a church keeping chickens and ducks. Is this an economic undertaking? Is it a charity undertaking (i.e. housing for displaced parishoners' fowl)? Is it insteaad something related to the Sunday school? Regardless, I don't necessarily object. I heard roosters consistently during my years living "on the hill" in Highland Park, in Northeast Los Angeles. I like the counterpoint the ducks provide, too. Tonight, I'm going to rush up to Ilsan, to try to sort out some paperwork related to securing a smooth transition to a new visa for my new employer, where I'll be starting May 1st. The end of my time at Hongnong Elementary is looming. It will be a bittersweet departure. Yesterday I felt so much joy and delight in the children's company, and I know I'll miss them. I've developed a lot of strong, almost parental-feeling attachments to individual kids: hyper Jeong-an who never sits still, serious Ji-min who tries to direct the class, the two madcap Do-hyeons who both always volunteer for anything, sweet Ha-neul who sadly reported she had to leave class early, the princesses Ha-jin and Ye-won who gossipped about their homeroom teacher to me, shy Jae-won who showed off his new cellphone, assertive Hye-jeong who yelled "teacher!" because I was ignoring her, tiny Seo-yeon who didn't want to perform, manic Jae-uk who insisted on performing, earnest Hye-rim who grinned at her high score, judgmental Min-seo who frowned seriously, blue-skies-dreaming Na-hye who said "I'm so happy", ultra-competitive Hui-won who cried because the girls' team lost, helpful Eun-jin who always helps me clean up at the end of class ... these are some of the ones that spring to mind from only yesterday's interactions. Mostly, they're current 2nd and 4th graders, with whom I've evolved very close interactions due to the afterschool program. I'm really annoyed at all the people who, seeing the nuclear mess unfolding in Japan, jump onto the pseudo-green anti-nuclear bandwagon. It's pure hypocrisy. Yes, there are dangers with nuclear power - and some of them are truly terrifying. But let's make a parallel. There are dangers in travelling by airplane, too. They are truly terrifying. But statistically, airplane travel is one of the safest we have. It's just that when accidents happen, they are catastrophic in nature. Likewise, nuclear power's failures tend to be catastrophic, but statistically, it's much safer than most carbon-based energy sources - meaning that adding up things like respiratory illnesses, mining accidents, and, of course, global warming, carbon-based energy is much worse for human health and the human environment, but it's much more rarely catastrophic. Making an SAT-style analogy: carbon-based energy is to nuclear energy what automobile travel is to airplane travel. More catastrophic, but safer. Get it? Stick to facts. Human fear is irrational. Don't let it rule you. I'm far from saying I'm an unconditional defender of nuclear power. But I will only say, I'd rather ban carbon than nuclear, in the world-of-today. And since realistically, politically, that's not going to happen, that means, in my desire to avoid hypocrisy, I'm driven to the strictly rational position that since nuclear is less dangerous than carbon, and since carbon is un-bannable, then therefore nuclear's risks must be socially acceptable. To argue otherwise is irrational hypocrisy. 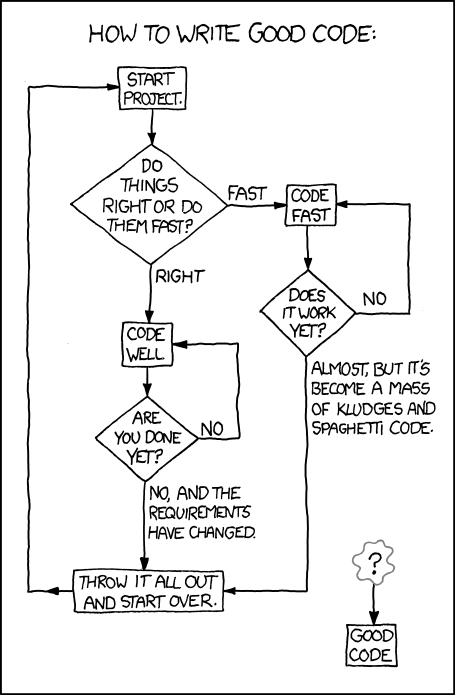 This xkcd comic seemed like a perfect summary of my last career. Study it carefully - it's the most exact description of computer programming and application development ever produced. Caveat: Right now is sometime! "Me get it, cookie is sometimes food. You know what? Right now is sometime!" - Cookie Monster, after a lecture by some other character, urging moderation. I miss Cookie Monster. And I love surfing the tvtropes.org website. I can find quotes like that, and spend hours and hours surfing a deeply ironical, often very well-written (mostly by vaguely anonymous volunteers a la the wikithing), pop-culture semiotician's paradise. It claims, "This wiki is a catalog of the tricks of the trade for writing fiction." No, it's not that - it's much more. It's a tool for navigating pop culture, and a database of semiotic trivia. I can't recommend it more highly. This is #41 out of a series of 108 daily Buddhist affirmations that I am attempting to translate with my hands tied behind my back (well not really that, but I'm deliberately not seeking out translations on the internet, using only dictionary and grammar). 39. 내 귀로들은 것만 옳다고 생각한 어리석음을 참회하며 절합니다. "I bow in repentance of all the stupidity that I believe by my own ears to be right." I would read this forty-first affirmation as: "I bow in repentance of all the stupidity that I believe by only trying tastes with my mouth." Ok. So I'm a wannabe foodie. But my laziness mostly trumps my fooditude. So I'll repent that instead? Perhaps I shouldn't admit this, here. But whatever. I really like Radiohead. They recently released a new album. I went to their website last night, and paid for a legal download of the album in mp3 format. I've had a lot of appreciation for their business model, as it's evolved, and I really see myself as mostly a "pirate due to circumstance" when it comes to music - which is to say, it's troublesome being a resident of South Korea wanting to use US- or Europe-based legal music download sites. Admittedly, I haven't tried in a few years - so laziness is a factor, too. But - anyway - I decided to buy a legal copy of the Radiohead album. I did. I paid my 9 bucks. And I got a confiming email. And then the download didn't work. It sent me somewhere in Japan. That didn't help. I tried something else. It said my email wasn't recognized. This morning, I monkeyed around a little bit on the website, looking for something resembling customer service. Then I had a little epiphany. I had paid for my album. I could just download it now, guiltlessly. Within 10 minutes I had located a torrent and downloaded Radiohead's The King of Limbs. Good album. Guilt-free piracy. Most of the deaths in Japan have been from tsunami flooding, not collapsing things. A huge evolution from the Kobe quake only 15 years ago, in 1995. Other bloggers have observed that this quake - having been so huge and yet having such a limited death toll (not to minimize this in any way) - is proof that the worst "natural disasters" are also social disasters - failures of the social contract. It is perhaps early to be triumphalist on behalf of engineers: they're still struggling with their abundance of nuclear power plants - and it's easy for me to imagine things could go horribly wrong, there. Certainly, if Korea were an earthquake-prone country (which it's not), I'd have much more ambivalent feelings about living 5 km from one of the largest nuclear facilities in the world. Caveat: Why Books of Poetry? What Is Fairness? I awoke at 2:55 AM from a strange dream. I was trying to explain to some Korean coworkers that I bought and owned books of poetry. This seemed crucially important, somehow, yet I was unable to clearly communicate the idea. And looking into the dream from the moment of awaking, it seemed mostly an absurd undertaking. My mother was there in the dream, too, although she said nothing. More oddly, my Minnesota friend Mark was there, and "playing a Korean" - at least, for the dream - and thus not understanding my linguistic efforts anymore than any of the others. The Koreans kept trying to change the subject of conversation to my age, my mysterious marital status, my teaching skills or my utterly inexplicable (to them) disinterest in consuming free food simply because it was free. I felt a lot of anxiety after waking up. We had yet another hweh-shik last night, and things have been getting tense at my school: yet another, new crisis in the foreign-teacher-housing. This time, anyway, it's more linked to my new fellow-foreign-teacher than to me, but it's nevertheless unpleasant to be around and it's a constant reminder of the ways in which I, too, have felt so mistreated by my school's administration in matters of housing. I guess I could say that, lately, not a day goes by, these days, when the validity of my decision not to renew isn't constantly reaffirmed. I'm worried that my school could probably easily find a way to throw some kind of obstacle up to my smooth transition to my new hagwon job that I've committed to for May. I don't want that to happen, but I can't help but attempt comment to my coworkers, when they ask, about my perception of the unfairness of things with respect to the housing issues (the details of which I'd rather not go into). Somehow, these rather frustrating and vaguely fruitless conversations with coworkers, over concepts of fairness and ethical business practices, etc., of which I've been having quite a lot, lately, got translated in my dream into an effort to tell them about my habit of buying books of poetry. Both ultimately may boil down to something absurd. A rooster is crowing. I don't mind that. Darkness before dawn. Cold apartment. This is #40 out of a series of 108 daily Buddhist affirmations that I am attempting to translate with my hands tied behind my back (well not really that, but I'm deliberately not seeking out translations on the internet, using only dictionary and grammar). 38. 내 눈으로 본 것만 옳다고 생각한 어리석음을 참회하며 절합니다. "I bow in repentance of all the stupidity that I believe in my own eyes to be right." I would read this fortieth affirmation as: "I bow in repentance of all the stupidity that I believe by only following the smells my nose finds." ... but... but... those homemade tortillas I made yesterday with my illegally imported, well-traveled Mexican corn masa (manufactured in Texas, bought in an imported food shop in Queensland) smelled so delicious! I made a cheese quesadilla. The Korean processed sliced cheese wasn't that good - kind of decadent - but the corn-tasting tortillas were excellent. "The global economy is like a zebra roller-skating through a Volkswagen factory in China on the Fourth of July and it's snowing." - Max Eichler, parodying Thomas Friedman in an article on Qaddafi's reading habits at the Atlantic Wire website. Yesterday, before leaving work, my new main co-teacher, Ms Lee (no relation to my previous main co-teacher, Ms Lee) told me that we would have no class on Tuesday, because the kids were taking some kind of important test. This is common enough. So I was planning on coping with yet another day of "deskwarming" - so soon after getting back into the swing of things with regular classes. When I got here this morning, she came over and told me that we had classes today after all. I had materials prepared, and so without comment I helped her get ready for class. She asked me, "How did you know the schedule was changed again? It seems like you already knew. I only found out last night by text message at home." I explained that I knew that the schedule would change again. She said, "How could you know?" I answered, "This is Korea, so I just figured." She found this embarrassingly funny. I think classes went fine, this morning. I love the new group of first-graders - who I knew in kindergarten last year. And the new second-graders are my old, beloved, hyper-rambunctious first-graders. Meanwhile, the school's administrative office is playing a lot of kafkaesque "imcompetent control and oblique obfuscation" games. I'm trying to ignore that. The kids are awesome. I've been surfing a lot of visual arts and graphic design sites and blogs. One I found recently is called "love all this," and there I found a link to a person who took 365 photos of star wars stormtrooper figurines (one a day for a year) and posted them to flickr. I began surfing through the pictures, and found myself inexplicably moved to laughter but also even poignancy and pathos. Like any good visual narrative, it's easy to "read between the lines" in the characters' actions and postures, deducing feelings and mental states that obviously aren't really there (since they're just plastic toy figurines, after all). I found the whole thing genuinely compelling. This is #39 out of a series of 108 daily Buddhist affirmations that I am attempting to translate with my hands tied behind my back (well not really that, but I'm deliberately not seeking out translations on the internet, using only dictionary and grammar). 37. 집착하는 마음과 말과 행동을 참회하며 절합니다. "I bow in repentance of all actions and words and heart that cling." I would read this thirty-ninth affirmation as: "I bow in repentance of all the stupidity that I believe by my own ears to be right." I have been utterly devoid of interesting or meaningful thoughts to blog about. My brain has been in one of its periodic "imagistic" phases, where I'm thinking a lot about visual arts, surfing "art" websites of various kinds, and being anti-textual. So I haven't blogged, or even thought about blogging. Nothing I felt like saying. Such neglect. Meanwhile, here is a photograph from my archives, I don't think I've posted it before. Sometime last Spring, I think. You know how you sometimes get a song stuck in your head, and it just won't leave you alone? And you go and download it somewhere, and you start playing it over and over again? This is a hip hop group from Minneapolis, that I heard on a "local sound" type radio program the other day. This track isn't that ... interesting, from a lyrical standpoint. But I love the way it sounds. A little bit like Atmosphere (another Minneapolis group), with a hint of something like Linkin Park maybe. Anyway... just sharing. "Optimism and pessimism are buddies sitting together on the same sofa." - John McCrea, lead singer of the band Cake, overheard in an interview on NPR. Cake is a very eclectic band. They can make songs I really like and others I abhor. But they're always rather cerebral, in a funky, alterna way. I'd never heard the lead singer interviewed before. He's an interesting guy. This is #38 out of a series of 108 daily Buddhist affirmations that I am attempting to translate with my hands tied behind my back (well not really that, but I'm deliberately not seeking out translations on the internet, using only dictionary and grammar). 36. 어리석은 행동으로 악연이 될 수있는 인연에게 참회하며 절합니다. "I bow in repentance of any ties that can become an evil destiny through stupid talk." I would read this thirty-eighth affirmation as: "I bow in repentance of all the stupidity that I believe in my own eyes to be right." Wow. And how do I identify my own stupidity if I believe it is right? I guess that's why it's about repentance, not prevention. The Korean school calendar works very differently from in North America. So sometime around the start of March, each year, the "school year" starts. Kids move up a grade. Teachers start or stop contracts or migrate schools (except for us wacky foreigners). Moms (and even a few progressive dads) show up and take videos of little Iseul's first day of school, as the kids nervously stand around in lines and formations meeting their teachers and listening to interminable speeches by authority figures. It's quite charming, in its Korean way. And having resolved that I'll be moving on in two more months, I got very sappy and nostalgic watching all my much-loved first-graders becoming proud and yet strangely equally rambunctious second graders, and all my kind-hearted third-graders becoming world-weary and yet equally friendly fourth graders. Here is a picture of the gym, as the kids did some high-grade waiting. They're in rows, front to back, by class. Second-graders in foreground, with sixth-graders farthest away. Teachers standing facing at the heads of the lines. Lot's of changes. New teachers. Some older teachers, gone. There is never much forewarning of these things - no one tells the foreigners much of what is going on. We have new English department co-teachers. Ms Lee is gone - some kind of sabbatical, related to her planning to take a big test to become a qualified highschool level teacher next fall. And Ms Ryu, the English "department head" (such as it is) whom I like so much... she's not gone, but she's no longer in charge of the English department. Adjustments forthcoming. Leaving school, I met Hae-rim's brother (whose name I always forget, because he insists his name is "crazy monkey boy"). He had a large box in front of the stationery store at the school's main gate. He opened the box. Hae-rim was inside. A passing random foreigner (yes, really, in Hongnong! - well, actually, it was just Glenn, the idiosyncratic Canadian who works at the middle school across the street) took our picture. Hae-rim, Jared, Crazy Monkey Boy. These are the kids I will remember very, very much, when I leave Hongnong. My third twinge of tweegret, today. Rather than try to explain, read this article. Seriously. Normally I try to stay away from the vast internet realms characterized by the charming label "NSFW." But @MayorEmannuel is a new masterpiece, apparently: Literature meets Politics meets Cultural Crit meets NSFW Obscenity. And Madrigal's article about it is brilliant! And no, I still have no twitter account.